The Commander of the Papua New Guinea Defence Force says, soldiers involved in the attack and assault of a senior police officer and his officers on New Year day will be dealt with. 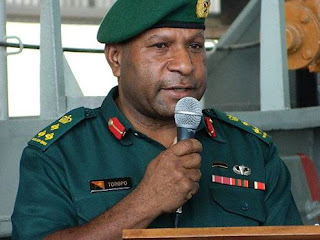 About nine soldiers went to the Boroko Police Station and assaulted several officers on duty as well as the National Capital District Metropolitan Superintendent, Ben Turi. Another senior officer received treatment for his injuries. The attack followed the disarming of a Defence Force captain, after he produced a firearm at a police roadblock. The Defence Force Commander says, the military will act accordingly. Brigadier General Toropo told NBC News that what the officers did was uncalled for, a criminal act, and an unacceptable act from a military personnel. He said it was not a war zone for a faction of the disciplinary force to use arms against another. Commander Toropo, who's out of the capital city, told NBC News through text messages, that he will investigate and find out which unit the offending officers belong to, and will hand them over to police. Commander Toropo said the offending soldiers will also be dealt with under the Code of Military Discipline.